Schloss Leopoldskron Palace was built by Prince Archbishop Firmian in the later 18th century. The house of Firmian expressed its re-covered self-confidence with Leopoldskron. Later, the palace was turned into a hotel and finally bought by director and theatre manager Max Reinhardt, one of the key figures at the founding of the Salzburg Festival. 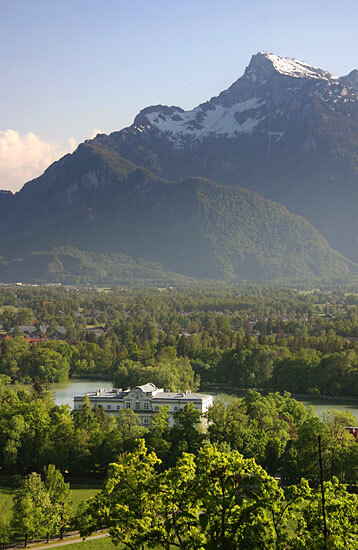 Today, Schloss Leopoldskron is owned by the Salzburg Global Seminar. In the background of the picture, you can see Mount Untersberg, the highest mountain in Salzburg′s immediate surroundings. The palace featured in ′The Sound of Music′ as the Villa Trapp, however, it never belonged to the Trapp family.